For the next five weeks, I will be writing about each of these energy principles. The first, and most important is the Energy of Purpose. When you know your purpose, it doesn’t matter what amount of money you make. It’s the excitement of doing something you love, that you are brilliant at, and that makes a difference in the world. It’s what makes you excited to get out of bed every day. When you look at people who have accomplished significant things in their lives, you might think you don’t have what it takes to make a difference in your life. But the truth is that the only real difference between you and those people is that they have a clearly defined life purpose that they selected for themselves and then embraced with dedication and determination. 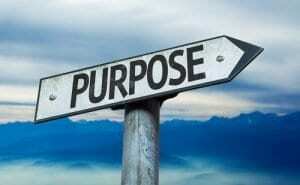 Now, finding and following your divine purpose is different from setting your goals. A goal is a tangible desire with an end result. But your divine purpose is really a way of living. For example, I might have a goal of learning how to play the guitar. However, my divine purpose would be to bring joy to others through music. Your purpose is the reason why you are here, both the being and doing. The questions to ask are “Who am I meant to be? and “What am I meant to do? Typically, when I ask clients these questions, the response is from an ego-based place, which is based in fear. To do what you are meant to do and be who you are meant to be will bring up challenges to your stability, the one thing the ego is set on maintaining. The trick is to maintain your ego and connect with your trusted source — whether internal, universal, or personal — to uncover what your purpose is.